We spent a day on bikes in the area of Lago di Fimon recently. I know...you expect me to extol the beauties of the lake. It's more like a pond, a stagnant pond, and while folks fish there, I'm quite certain that I would avoid any fish whose origin is Lago di Fimon. However, except for that particularly smelly part near the half-way point of the trail, the path around the lake is quite lovely with a variety of plant life, hissing swans, and feral cats, and I encourage you to explore it on a cool day. 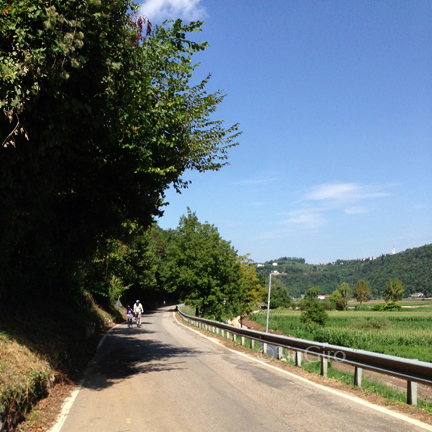 We did just that Saturday with friends from the paese. 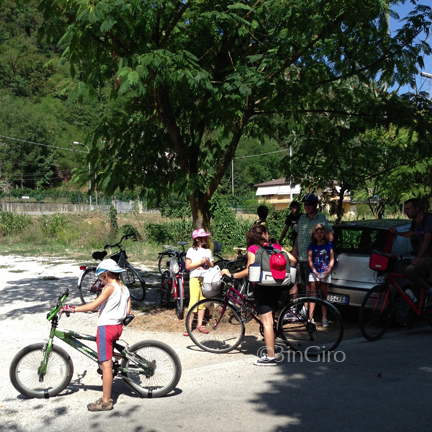 A great biking adventure along a path that initiates in Valsugana was thwarted by possible bad weather and a sick child. 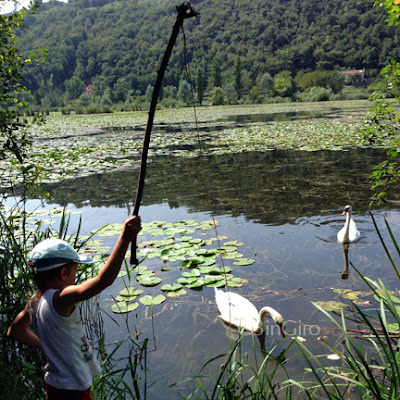 Our back-up plan was the pond...eh...Lago di Fimon. 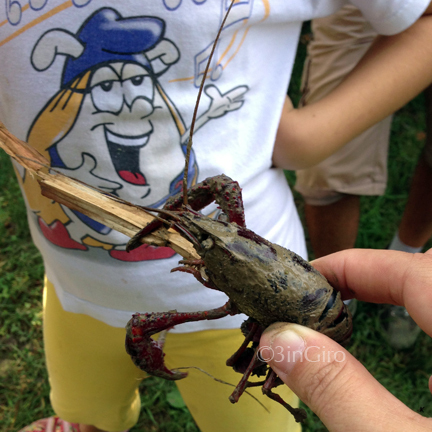 Crawfish have invaded the lake and are wreaking havoc on the local ecosystem; locals call them Gamberi Killer. A recent article in the local newspaper warned that we should not eat them. I'm not sure if I'm buying that, but I doubt I'll be hosting a crawfish boil either. "Wasted opportunity!" says the Cajun in me. We left Young One with the neighbors for a picnic and made our own giro of the lago, stopping at a place near the lake with a great selection of beers. Oh, yes we did! 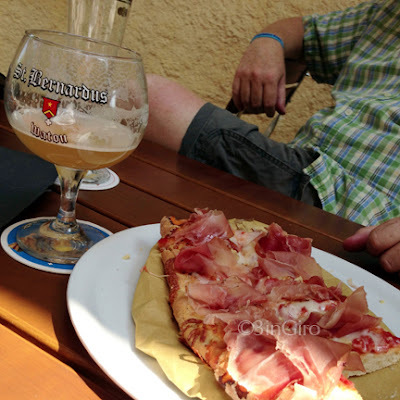 Our friend Michael, who was one of those visiting people from July, the one who took us to La Pria, found an absolute gem of a place on/near Lago di Fimon: Birreria Miralago. We shared a (pizza dough) bruschetta with blue cheese, walnuts and Speck along with a couple of beers. They have several from Germany and Belgium on tap; I chose a Belgian St.Bernardus white beer that brought me joy. I don't recall if the selection includes Italian beers, but really, why bother? 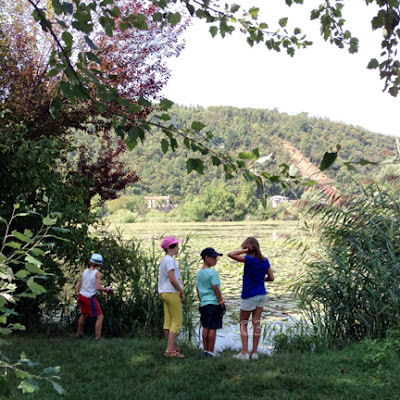 Btw...there is a man-made lake stocked with trout that is just a bit past Lago di Fimon. You show up, fish, and pay for those you take home. Not ideal but perhaps a better choice for fish than Fimon, as long as you don't think too much about what they might be feeding those fish. Just follow the road that runs near the birreria. 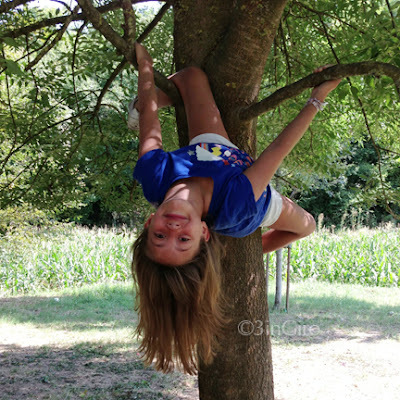 Love love love the picture of the YO hanging upside down from the tree--such a perfect expression of a child her loves childhood. Perfecto!